In case you missed it I have a 10-part series on Silverlight 5 on SilverlightShow.net. 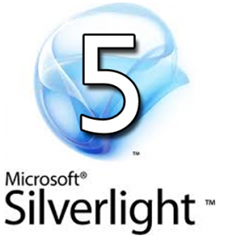 In this extensive guide to Silverlight 5 I give a step-by-step introduction to Silverlight 5 and dives into the features most important to a Silverlight developer. You can check out the first 3 parts now and I will be adding a new one each week. I’ve included the Roadmap for the series below as you may want to visit other sections as you learn Silverlight 5. I picked the following features as I thought that you may find them useful in your day-to-day work. If you want a specific topic covered then please leave it in the comments below. 1) Introduction to SL5 – This post which provides a brief history of Silverlight and relevant links. 2) Binding - Ancestor Relative Source Binding and Implicit Data Templates. 3) Graphics –XNA 3D API and Improved Graphics Stack. 4) Media - Low-Latency Sound using XNA and Remote Control and Media Command (Keys) Support. 5) Text - Text Tracking and Leading Linked and Multi-column Text OpenType Support Pixel Snapped Text and TextOptions. 6) Operating System Integration Part 1 - P/Invoke Multiple Windows and Unrestricted File System Access in Full Trust. 7) Operating System Integration Part 2 - Default Filename for SaveFileDialog 64-bit browser support and Power Awareness. 8) Productivity and Performance - XAML Binding Debugging Parser Performance Improvements and Multi-core JIT for improved start-up time. 9) Controls - Double and Triple click support PivotViewer and ComboBox Type-Ahead. 10) Other items - In-Browser HTML PostScript and Tasks for TPL.